Activists believe that Chinese and foreign mining companies are taking “undue advantage” of Tibet’s untapped mineral wealth, endangering the region’s fragile ecosystem. 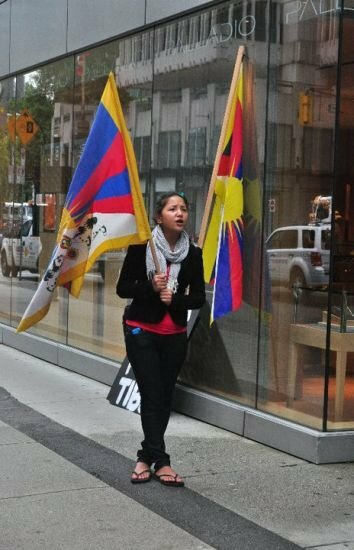 Local Tibetans and supporters in Vancouver held a protest Saturday, 16 October 2010, against the acquisition of the Gyama (Ch. Jiama) mine by the Vancouver based China Gold International Resources (CGG). The protest occurred in front of the Terminal City Club where CGG shareholders were holding a meeting for “approval from its disinterested shareholders for the acquisition of Skyland Mining, the owner of the Jiama Project”. The protestors held banners and Tibetan national flag, and shouted slogans demanding stop to exploitation Tibet's natural mineral resources. "China Gold, Human Rights on Hold" and "China Gold, Humanity on Hold", read banners. Located in the Meldro Gongkar County of Lhasa municipality, the Gyama mining project is one of the eight priority construction projects of China to exploit Tibet’s rich natural resources. Chinese mining company last year carried out a water-diversion project in the upper Gyama region leading to forceful confiscation of agricultural lands. The mining, which has been going on in the upper hills of Gyama for nearly two decades have led to toxic wastes being dumped into Gyama Shingchu river resulting in the death of a large number of cattle last year. Villagers in the valley depend on Gyama Shingchu for their drinking water supply and irrigation. However, the river has since dried up due to destruction of its source by excessive mining. Many of the natural springs in the area have also dried up deteriorating their drinking water supply, sources said. CGG is controlled by the state owned China National Gold Group, which was also the major shareholder in the Gyama mine. Protestors say that mining operations on large scale in Tibet leads to violation of Human Rights, environmental degradation and pollution, confiscation of property, forced resettlement, imprisonment, torture and death of those who protest against the mining operations. Angry villagers took to streets on 20 June 2009 and clashed with Chinese miners. Scuffles between angry Tibetans and miners were followed by police crackdown leaving 3 Tibetans wounded. The local Tibetan residents from Gyama township last year reportedly petitioned the local government to put an immediate halt to the mining project in the area. The local government, however, is said to have paid no heed to the petition, and the whole region remained under heavy military surveillance, with imposition of severe restrictions on communication to outside world and people visiting the region. The Gyama mining project is currently China’s largest mining project operated by a central state-owned enterprise in “TAR”. It is reported that the first phase of this project currently has an expected daily output of 6,000 tonnes. The project, which involves gross investments of 8 billion yuan, (1.18 billion U.S. dollars), is designed to have a total daily output capacity of 15,000 tons, according to Chinese state media. Mining in Tibet is a contentious issue. Tibetans have long been professing the faith of holding nature as being too sacred to be disturbed. But with more and more mining companies operating in Tibet, activists say there is a great danger to the region's fragile ecosystem. Critics say Chinese and foreign mining companies are taking full “undue advantage” of the troubled Tibetan situation in exploiting Tibet’s untapped mineral wealth. They argue that no significant effort is made to consult the Tibetan people or to seek their informed consent on the issue. Gyama Shen in Meldro Gongkar is the birthplace of Tibet’s great king Songtsen Gampo (617-650 AD). There are fifteen villages in the valley, two of which are nomadic.